Hello friends, Happy Tuesday to you. 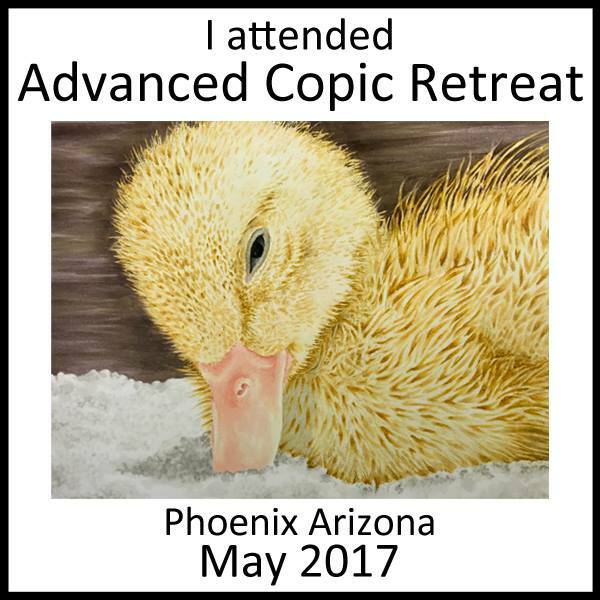 We have a new challenge going on at Crafty Sentiments Designs. This week's challenge is anything goes and I created a card using Annabel-Mermaid Hair. She is so cute and love the way this card turned out. I colored the image using copic markers and cut her out using my brother scan and cut. I used a hero arts front panel die to create the ocean scene. 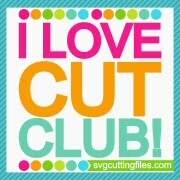 I cut out the sentiment using a banner die from MFT. Before popping the image up on foam tape, I added some stickles to her tail to give it some added pop. I finished the card off by added some nuevo drops around the image. Don't forget to check out the other ladies and their creations over on Crafty Sentiments Designs blog. Thanks for stopping by and we will chat soon! Hello crafty friends, its SATURDAY and it's time to get crafty! I am locking myself in my craft room this weekend and getting crafty. 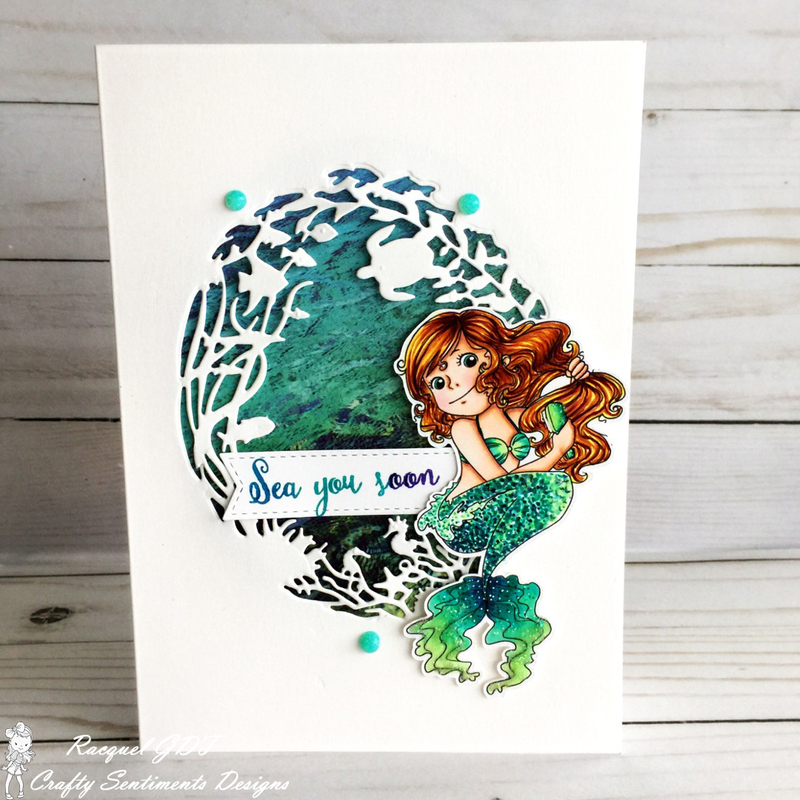 Let's talk about this card I created using Papernest Dolls Avery with Seashell. 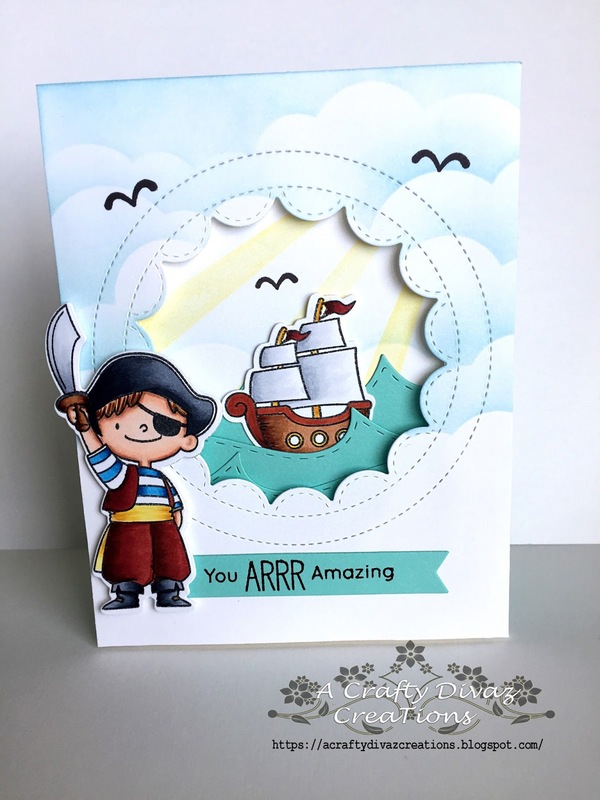 I used Heartfelt Creations tropical paradise paper collection for my card. I colored the image using my copics. This card reminds me of Hawaii, truly tropical. That's all I have for you today, thanks for stopping by. 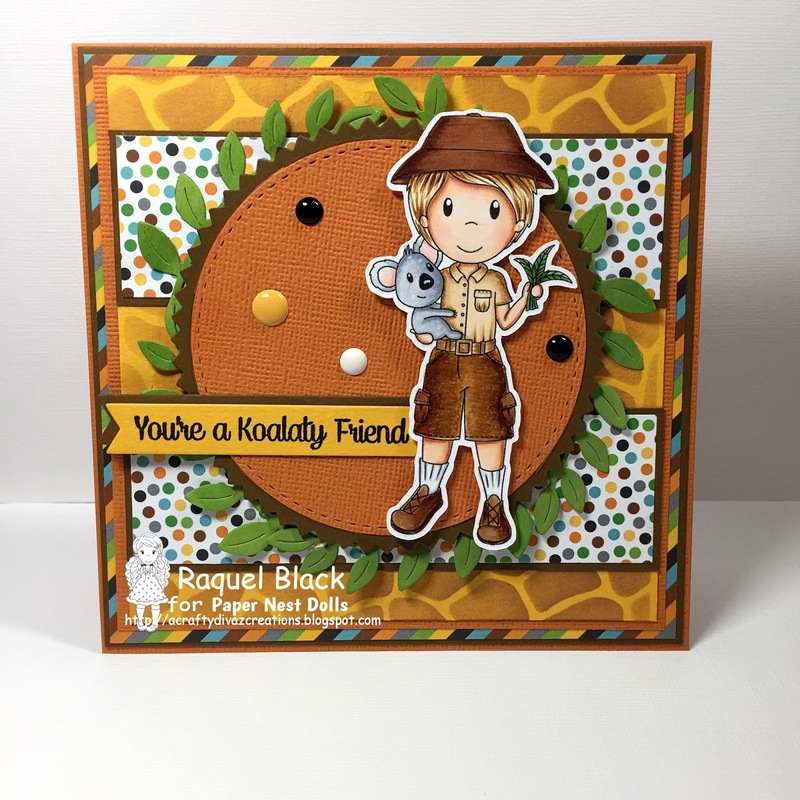 Don't forget to check out the paper nest dolls store for this and other cute stamps. Have a great weekend and we will chat soon. Hello friends, Happy Thursday to you! Hope your week is going well and you are ready for the weekend. I have a card share for you today using My Favorite Things party like a pirate stamp set from their new release. When I saw this stamp set, I had to have it. Those pirates are just adorable. I colored the pirate and boat with my copics. 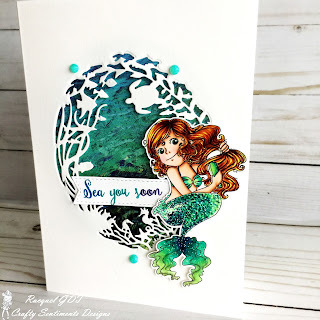 I used the MFT's cloud stencil to create the background and the sun ray stencil to add the rays. I die cut the waves using Taylored Expressions rolling waves die and cut out the card panel using Mama Elephant columbus circle framed tags. I stamped out the birds and sentiment from the same stamp set. 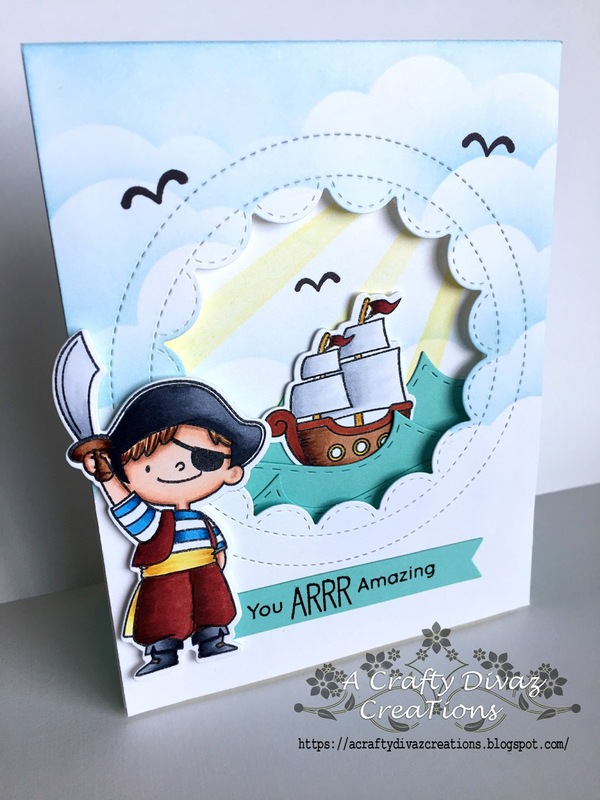 This card was fun to create and love the way it turned out. Well that's all I have for you today, thanks for stopping by and have an Awesome Thursday. Hello friends, thanks for stopping by today. We have a new challenge that started over on Crafty Sentiments Designs blog called Summer. I decided to create a shaker card using Jasmine chilling in the sun. The designer papers I used are Echo Park Summer Dreams. I colored the image using my copics and cut her out using my brother scan and cut. I popped her up on the shaker frame to finish the card off. That's all for today, thanks for stopping by. 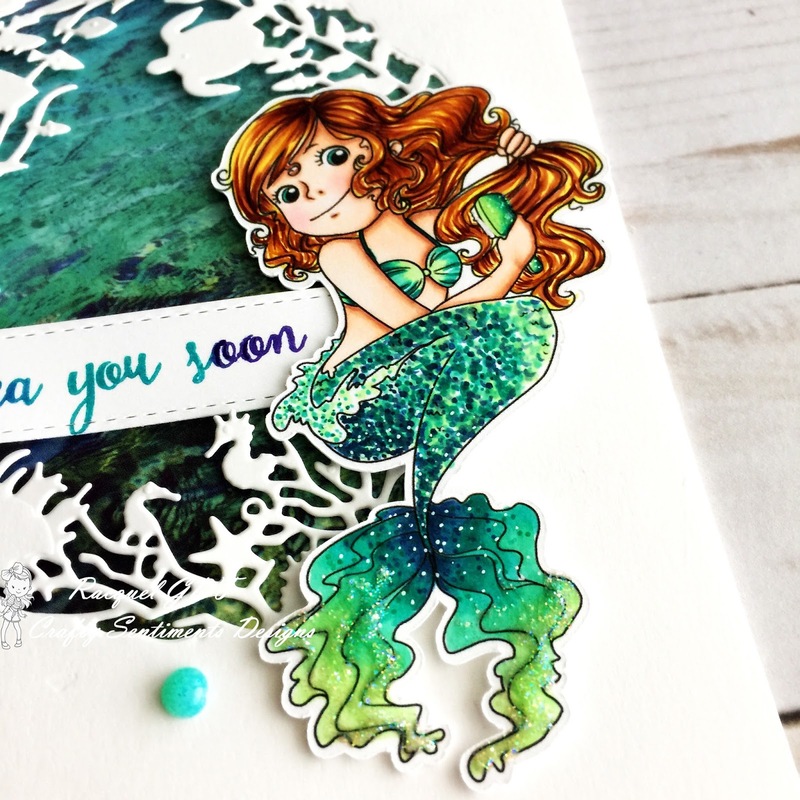 Don't forget to check out the other fabulous ladies on the blog to see what they created for this challenge. Have a great day!!! Hello friends, Happy Saturday to you. Hope you are having a great start to the weekend. 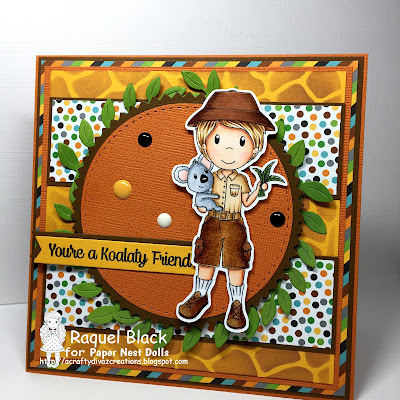 I have a card share for you today using Paper Nest Dolls Safari Owen. Safari Owen is apart of the new release this month. I colored the image using my copics. 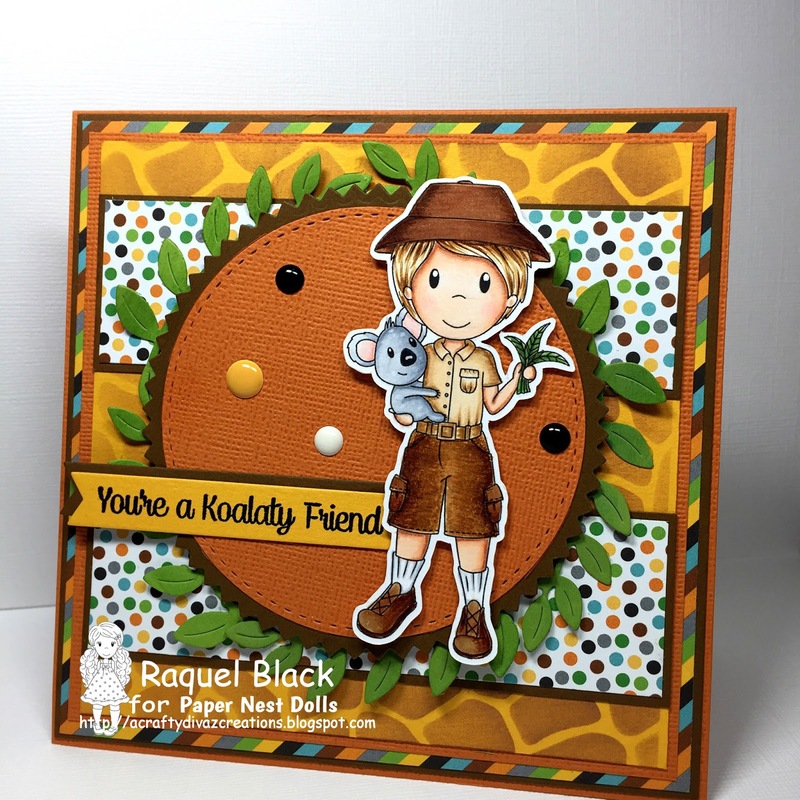 I used the new doodle bug zoo paper collection to create this card. I found a giraffe stencil in my stash and decided to use it on this card. It was a perfect time to use this stencil. I used distress oxide ink to create the giraffe stencil background. I die cut some leaves and placed them around the stitched dic cut circles. 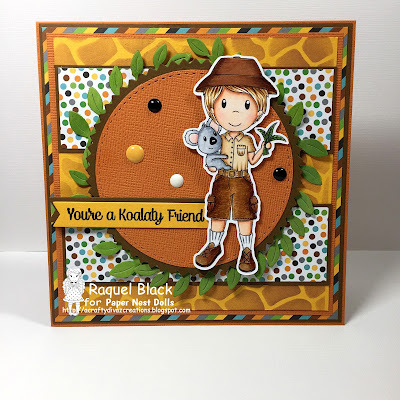 I die cut the sentiment out using a flag banner die and I finished the card off with some enamel dots. That's all for today, thanks for stopping by. Don't forget to check out the new release this month in the Paper Nest Dolls store. Have a great weekend!